I love trying new things once in a while and so last weekend I made some embroidery wall hoop art! 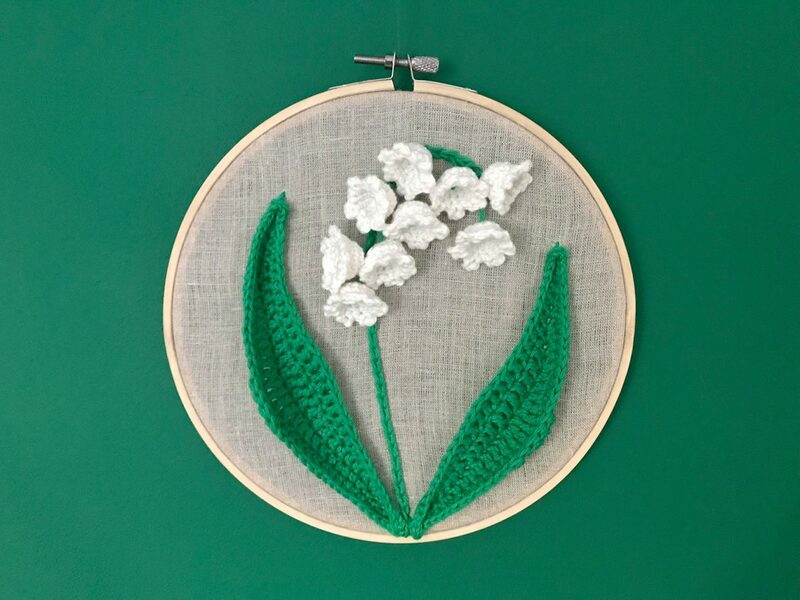 I don’t know much about embroidery (although I’d love to learn more about it) but I thought, why not crochet whatever I want my wall art to picture? 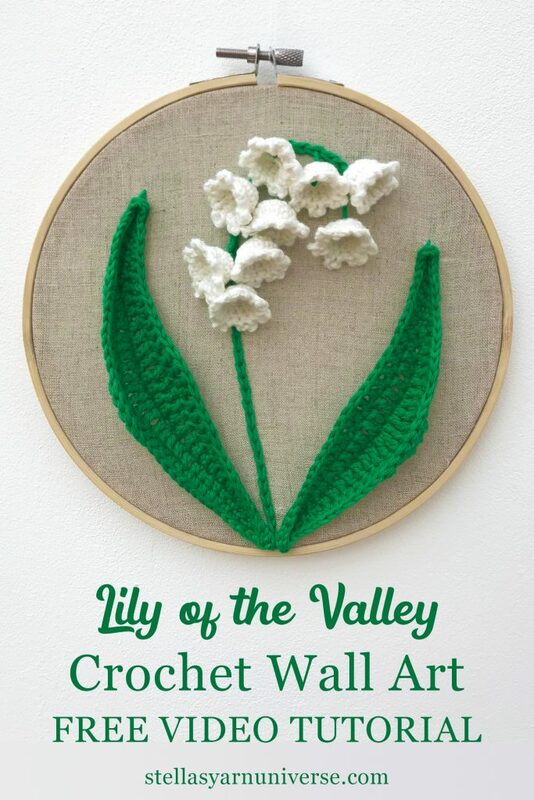 One of my favourite spring flowers is the lily of the valley and so that’s what I started with. 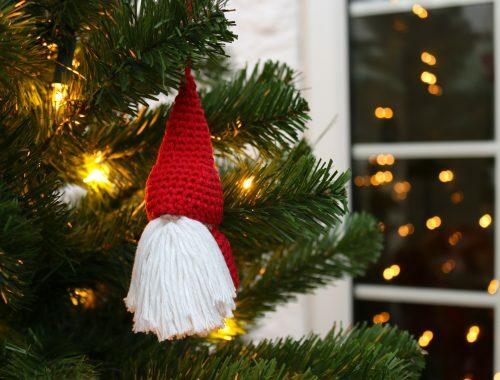 This is a great project for improving beginners as well as practised crocheters. Also it would make a thoughtful handmade gift for mum this Mother’s Day. To complete the spring flower wall I will definitely add some more flower embroidery hoops though, like bluebells. I just love bluebells! What is your favourite spring flower? Which one should I make after that? Please comment below, I’d love some inspiration! I encourage you to have fun with this! 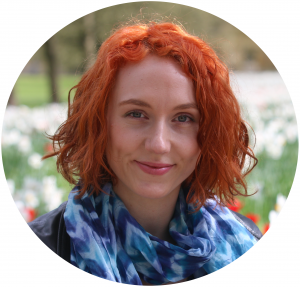 In the video tutorial I explain how you can come up with a pattern for the leaves, depending on how long you’d like them to be and how you want to place and shape them. 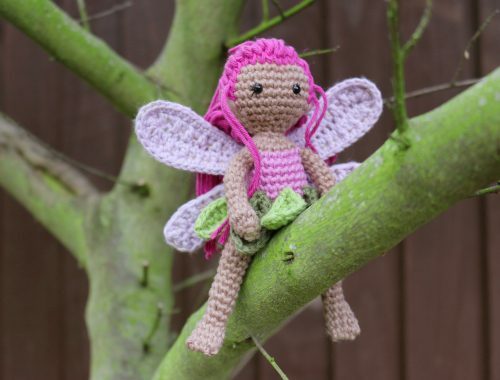 I do give you exact instructions on how to crochet the blossoms. 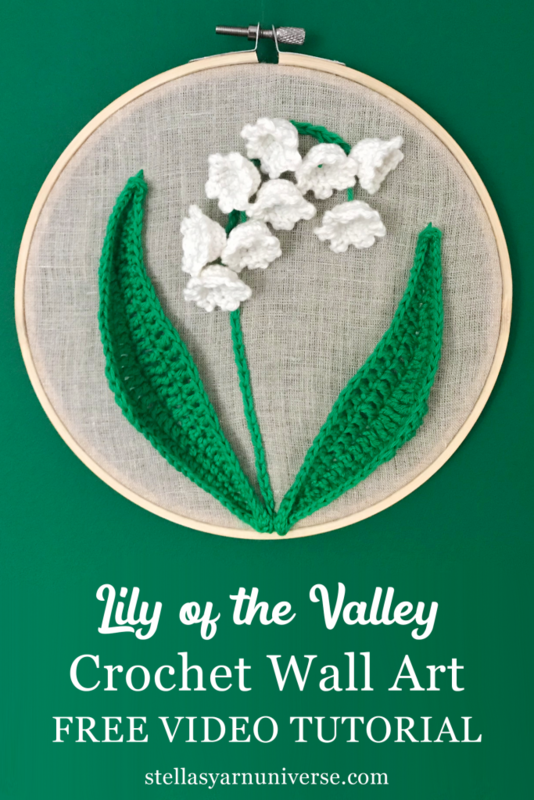 If you like the way I designed my lily of the valley and you want to do exactly that, you can work with the pattern below, accompanied by the video tutorial. Let me know in the comments (here or on YouTube) if you have any questions. 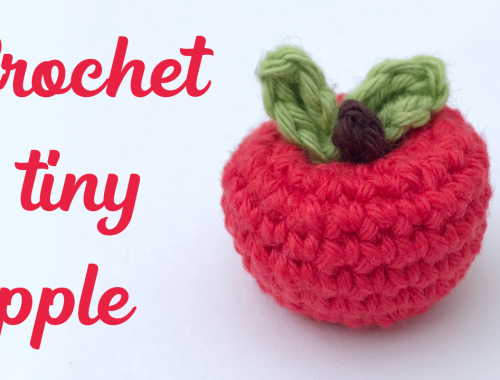 This pattern is written in U.S. crochet terms to match the video tutorial, which it is meant to accompany. 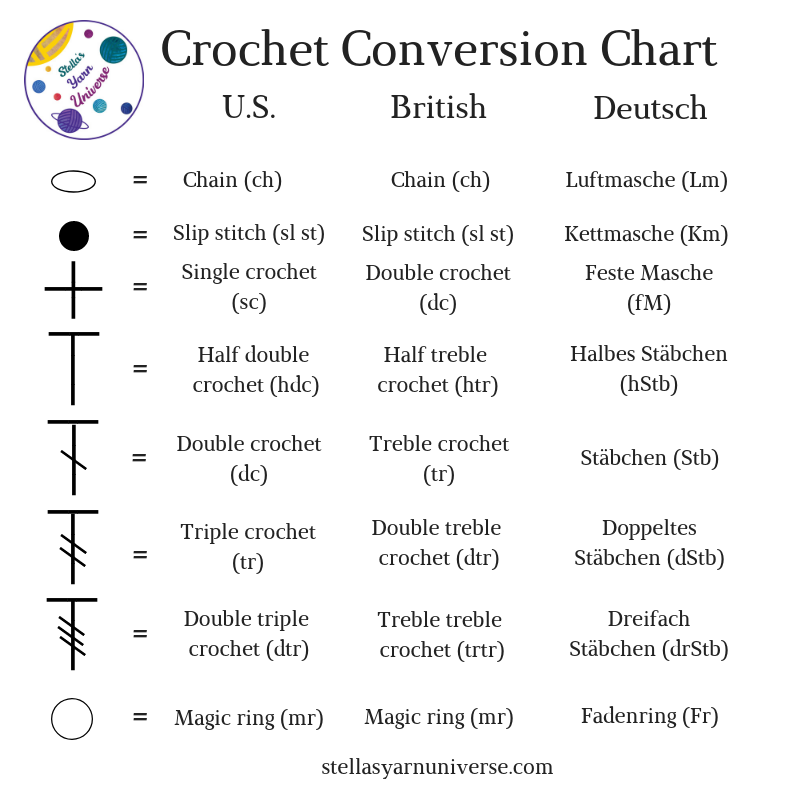 Please take a look at my conversion chart to convert it to British/Australian or German terms. Place the hoop in the middle of your piece of fabric. Draw a circle around it so you know what the frame of your flower will be. Remove the hoop and draw a line where you want the stem of the flower to be and two lines where you want the middle of the leaves to go. Embroider along the lines you drew with chain stitches (see how in the video). For the left leaf I made 32 and for the right 29 chain stitches. Stitch through to the other side right behind the last chain stitch you made. Break yarn, pull through, stitch through to the other side using your tapestry needle. Tie ends and cut them short. Break yarn, sew in end. Cut an approx. 10cm /4″ piece of yarn in C1. Tie it to the tail end of the blossom and pull the tie down, so it is hidden inside the blossom. Make another knot and thread the green yarn onto your tapestry needle. Stitch outwards through the middle of the magic ring. Cut the ends inside the blossom short. Attach the lily of the valley blossoms to the stem. You can see how I did that in part 2 of my video tutorial. Now your piece of art can go onto the embroidery hoop. Make sure you stretch the fabric enough so that any little wrinkles are evened out. You can stretch it a bit by gently pulling on the edges, then tighten the hoop a bit more, stretching some more, and tighten further until it is nice and even and everything stays in place. Trim the excess fabric. 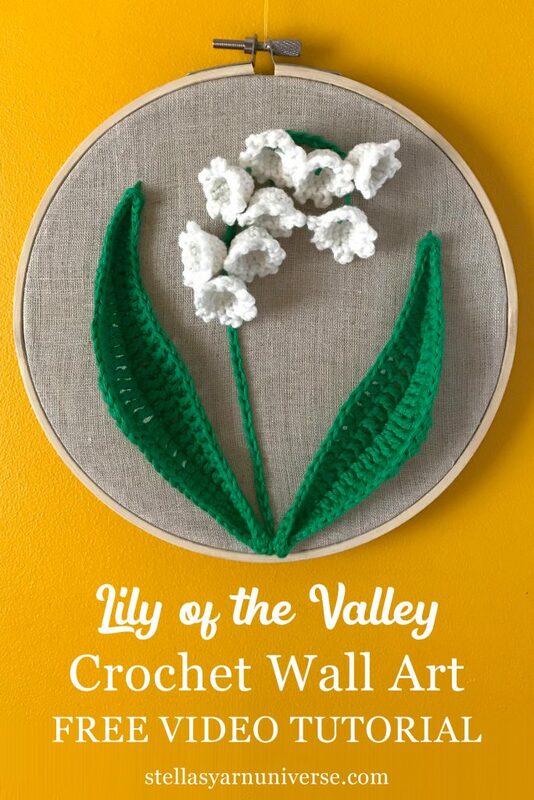 And complete is your lily of the valley wall art! I hope you enjoyed the process of making it as much as I did! If you wanna save it for later, you can pin it here. 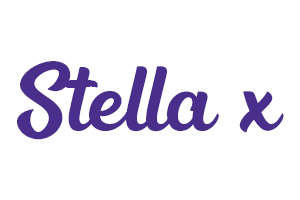 If you wanna share your work on Facebook or Insta, make sure to tag me with @stellasyarnuniverse so I can have a look and applaud you! Btw I need you help! Where should I hang it? On the white, the green, or the yellow wall? Please tell me where it looks best in your opinion. Also please comment below with any questions you might have. I’m always happy to help and will get back to you asap.